Hello Pops and Podgers! Christie and I are so darn excited to start making craft kits! This has been something we have talked about doing for the past 3 years... but life and babies and kids and jobs and everything in between seemed to get in the way. But, we have put together our first kit, and it's up for sale on our Etsy shop! Good question! Christie and I have a little craft group that we do every couple of months or so. We decide the crafts, put everything together for it, and then have our friends come over and we get - our - craft - on. They love it because they don't have to do any of the work behind getting the craft ready... they just get to show up and do the fun part!! How awesome sauce is that? Just show up and craft instantly? It's pretty much a win-win scenario. So, Christie and I thought it would be fun to share our craft kits with all y'all. 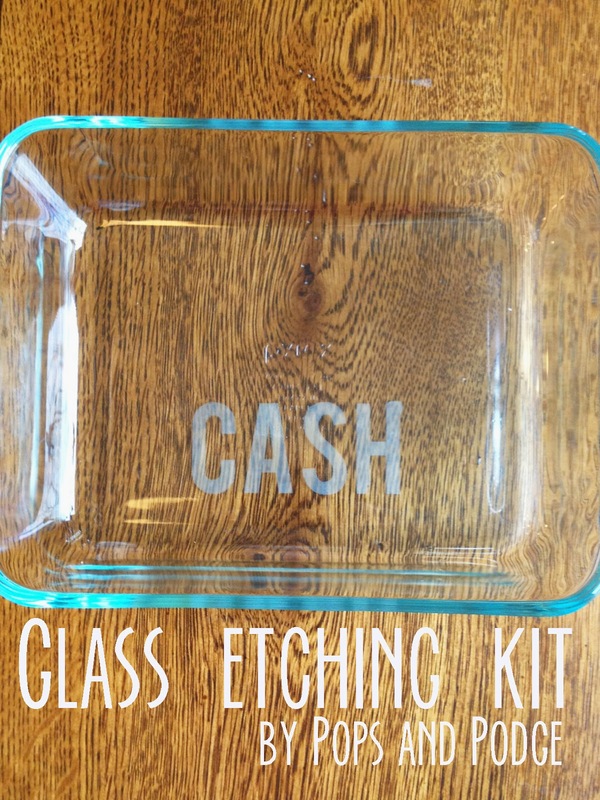 We decided to kick off our craft kits with a Glass Etching Kit. 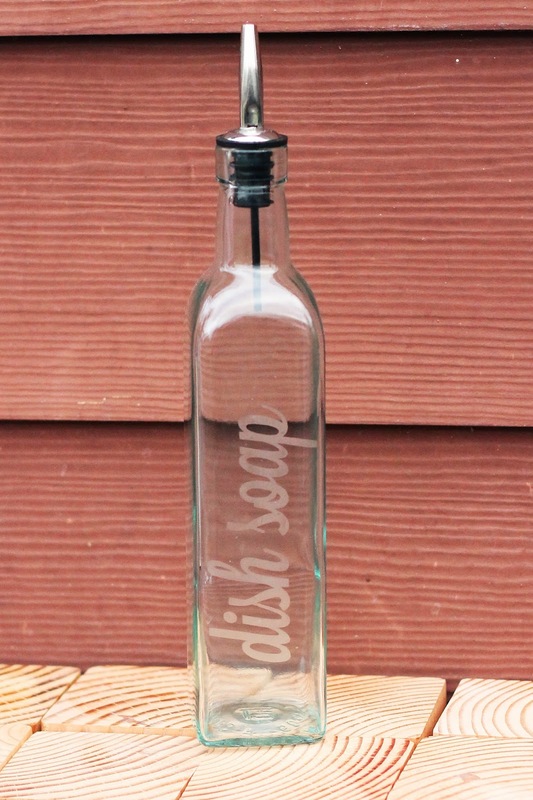 Etching glass is a fun and super quick way to personalize your glassware! A couple of years ago for Christmas, I went to the dollar store, bought some drinking glasses, and etched each family member's name into their own glass. I gave it to them with their favorite soda, favorite candy, a movie, and some popcorn. It was so fun to create, and it's a gift that can be used over and over again! I've also etched all my glass pans with my last name. I can't tell you how necessary this is!! If you take food to some dinner, or reception, or whatever, there will be NO mistake which pan is yours!! And unlike that hideous masking tape some women have branded their pans with, you don't have to worry about your name coming off in the dishwasher! So, we all know that glass etching is important. After I had decided to etch my pans a couple of years ago, I went to Michaels and looked into buying glass etching cream.... and I was SHOCKED with how expensive that goop was. Seriously! $25 for like a 10 oz bottle! What the heck? I certainly didn't need that much cream to etch 3 pans! And that price! I pretty much fainted in the middle of Michaels over that price.... but I bit the bullet and bought it. Now, almost 3 years later, I still have that same bottle sitting in my craft closet. Sure, I've used it a few more times, but it still makes me cringe thinking of how much I paid for that bottle. Sometimes, the cost of crafting takes the fun out of it. It can take a lot of time and resources to get all the necessary supplies in order to complete a craft! And that's precisely why you should let Christie and I do the hard work for you. Just let us gather all the supplies, ship them to you, and you can party hardy while you craft! And of course, if you would like something custom made, you can always contact us and we are more than happy to work with you! We have put together a video with instructions for each craft kit we put together. Pictures are great... but I am a visual learner. I can follow instructions 134% better if there is a video vs. pictures. I'm not bad mouthing pictures... I'm just telling you what works for me! You can purchase a kit through our Etsy shop. Each kit costs $9.99 plus S&H. If you want to order more than 1, you can contact us for special pricing!